Once upon a time, air travel was considered glamorous. Travelers dressed for the occasion, and were treated to courteous service, meals and snacks, pillows and blankets, and you arrived at your destination refreshed and relaxed. These days, airline passengers typically find more fault than fun in air travel, and the very thought of flying with a baby for the first time might be daunting enough to put that first family vacation off indefinitely. But seeing the world through your baby’s eyes is worth the effort! And each trip gets easier and easier as you become more seasoned travelers together. And while flying with a newborn is very different from flying with a toddler, there are some basic, tried and true tips and tricks that will help to make that first flight with baby a lot less arduous. Lap infants rarely are given any baggage allotments. So if baby will be traveling on your lap, you’ll need to fit all of your and baby’s necessities in your carry-on allowance. If you’re purchasing a seat for your baby, he’ll get a full carry-on allotment, but you’ll have to carry it. 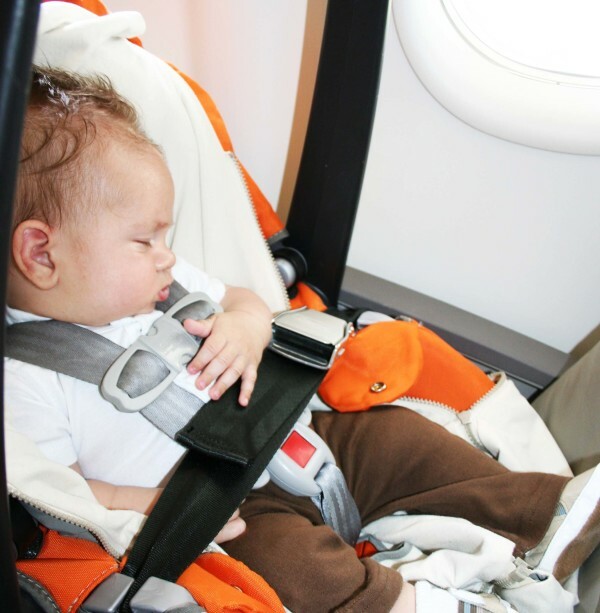 You will also need to bring on board a car seat approved for airline use, or the FAA-approved CARES harness. Mid-flight is not the time to realize you’ve forgotten to pack baby’s beloved security blanket, or the spare pacifier is in your checked luggage. Use a detailed carry-on packing list to ensure you’ll have everything you need on hand, and everything includes extra diapers, wipes, snacks, formula or expressed breast milk, toys, clothes, and books. Younger babies require fewer distractions, and don’t be afraid to introduce older babies to the miracle known as a tablet computer. By downloading fresh apps, stories, and shows, tablets literally lighten your carry-on load. The usual liquid restriction rules don’t apply when you’re traveling with a child under two years old. You may travel with milk or juice and any purees your baby might need. But it’s a good idea to separate all of baby’s drinks and food from the rest of your carry-on luggage, so it’s easier for airport security to inspect it. While you may no longer don your Sunday best for a cross-country flight, dressing appropriately for a flight means both you and baby will be more comfortable and look more presentable too. Layers are a great idea: not only is it helpful for temperature regulation, it’s also helpful for controlling mess. Inevitably there will be a spill, a smear, or—even worse—a diaper explosion, and it’s much easier to replace a layer as opposed to an entire outfit. Make sure you include a plastic bag or two in your carry-on, you may need one for a mid-flight laundry bag. If your airline offers it, take advantage of family pre-boarding and use that time to get your surroundings organized. Put your main necessities within arm’s reach, so won’t need to fumble around once everyone’s crammed in. Keep baby busy, and stick to your routine as much as possible. If you’re flying during a meal time, feed baby as per usual. Nap time? Encourage sleep with your usual comfort items and keeping stimulation to a minimum. Always be ready with a toy or a snack at the ready. Air pressure is harder on a baby’s ears than on an adult’s. The act of swallowing helps to relieve that pressure, so a bottle, snack, or even a pacifier will help. It’s a good idea to have some infant pain relief medication on hand as well, and don’t hesitate to use it if you believe baby is in pain. Let’s face it, flying with an infant is not going to be the most relaxing experience. The simple fact is, a comfortable and engaged baby is usually a quiet and happy one. Focus all your energies on your baby, and chances are your fellow travelers will be much happier about that than a set of earplugs or a care package of candy. Now is not the time to employ any new discipline tactics or sleep training methods, but sometimes babies just cry. And your attention needs to focused on soothing baby, not the adults around you. Corinne McDermott is the founder of HaveBabyWillTravel.com – a website with a mission to inspire, motivate, and help families travel with babies, toddlers, and young children.